Ingots are created by placing an unshaped ingot in a crafting grid to remove the ingot from the mold. The empty mold will be returned to the inventory; although there is a chance of it breaking and being lost. Creating an ingot will only work if the metal is in a solid state. The temperature will be carried over from the unshaped ingot temperature. Ingots are the starting material for all smithing. Ingots are heated in a forge and then worked in an anvil to make weapons, tools, trap doors and armor. Two ingots can also be welded together to create double ingots. Ingots can also be crafted with a ceramic mold to create an unshaped ingot. Heated ingots can be quickly cooled off by placing them in a Barrel or Large Ceramic Vessel full of fresh water. The majority of ingots are stored in ingot piles. The exceptions are high carbon, weak, and unknown ingots, which are stored in a chest. Each pile can store up to 64 ingots of a single metal. Ingots can only be stored in an ingot pile if they are completely cooled, and have not been worked on an anvil. Ingots that have been worked on an anvil will have a message in the tooltip that is visible while hovering over the item in an inventory. Ingots that have been worked must be re-melted and removed from the mold before being able to be placed in a pile. To create an ingot pile, sneak (Default: ⇧ Shift) and right click with an ingot on a solid block, or a full ingot pile. To add more ingots to the pile, sneak and right click while holding an ingot of the same metal. To remove an ingot from the pile, simply right click on the pile. If an ingot pile is taller than one block (more than 64 ingots), and is composed entirely of one metal type, right clicking on the middle or bottom of the pile will remove an ingot from the very top of the pile. If an ingot pile of a different metal is placed on top of a full ingot pile, removing an ingot from the bottom pile will cause the top pile to collapse, dropping all of the ingots on the ground. Ingots can be placed into the world to create an ingot pile. Ingots can't be stored in chests. Ingots with temperature or that have been worked cannot be placed. Hot ingots can be placed in a barrel full of water to cool it down. Ingots are removed from a mold by placing it in the crafting grid. Ingots cannot be stored in vessels. Ingots act like log piles in that they must be placed on top of solid blocks, or a full ingot pile. Removing an ingot from the middle or bottom of a multi-block pile results in all ingots above it to merge down. If a different type of metal is on top, it will break and drop the ingots. Ingots cool at the same rate regardless of what inventory they are in. 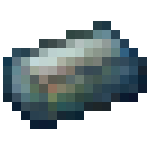 Ingots have tooltips for workable, weldable and in danger of melting states. Added metal trapdoors which are made by combining any metal sheet with any metal ingot. Ingots cannot be stored in the solid storage of barrels and large ceramic vessels. Ingot piles containing 64, 48, 32 and 16 ingots of different steels. This page was last modified on 15 March 2015, at 06:06.